It’s been a couple weeks since we’ve done a Simple Sunday post, but we’re back, and today we have quite possibly one of the easiest dinners you could make! 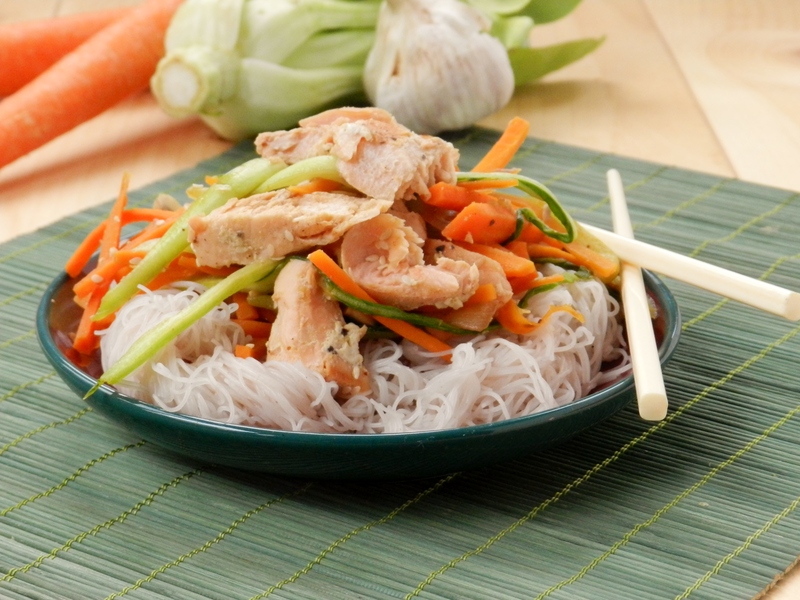 Because in our opinion there is no simpler a meal than a stir-fry! But simple does not mean boring or bland- all you need is a few ingredients to give it a pop of flavour. All you need is one pan, a handful of veggies, a source of protein and a little seasoning and you’re in business, people! So what went into our stir fry this time around? Carrots, bok choy, onions, mushrooms and salmon. Only a few ingredients but we assure you our family ate it right up! We feel as though the stir-fry has been shoved under the rug. Its a meal that many cooks turn there noses up at, one that is considered “too simple” or “commonplace”. Stir-frys are under appreciated in our opinions, so today we’d like to give them the spotlight. Let them take back the credit that is rightfully theirs. 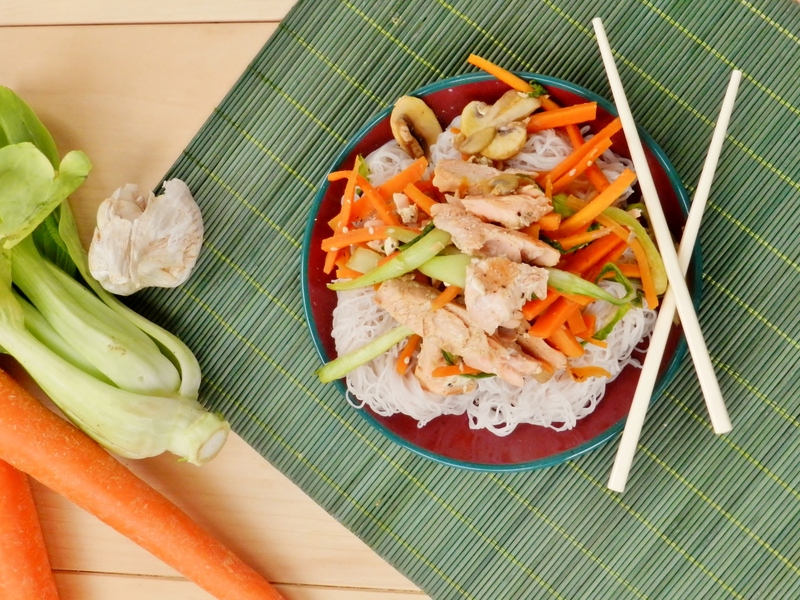 So grab your frying pans and join us in a deliciously simple stir-fry-making extravaganza! Heat the oil in a large frying pan over medium-high heat. 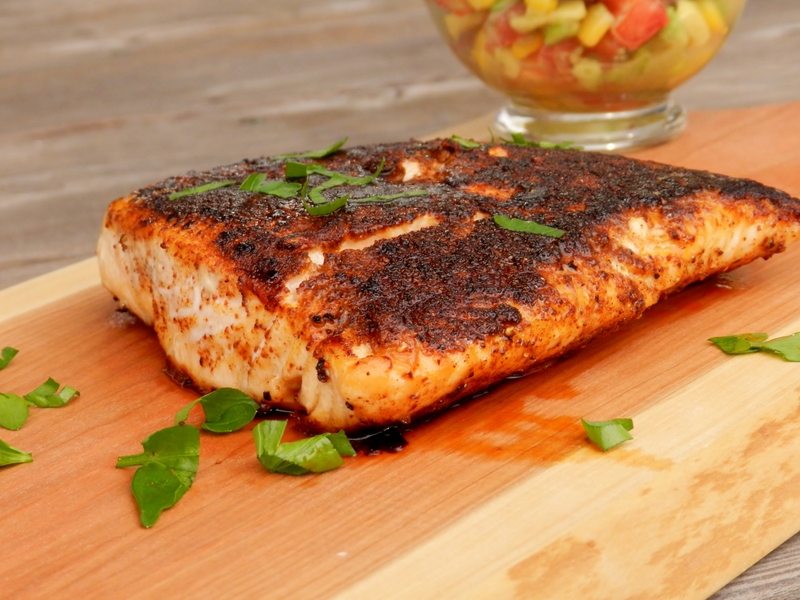 Sprinkle the salmon filets with black pepper and garlic salt or powder. Place in the pan and cook for 5 minutes on each side. 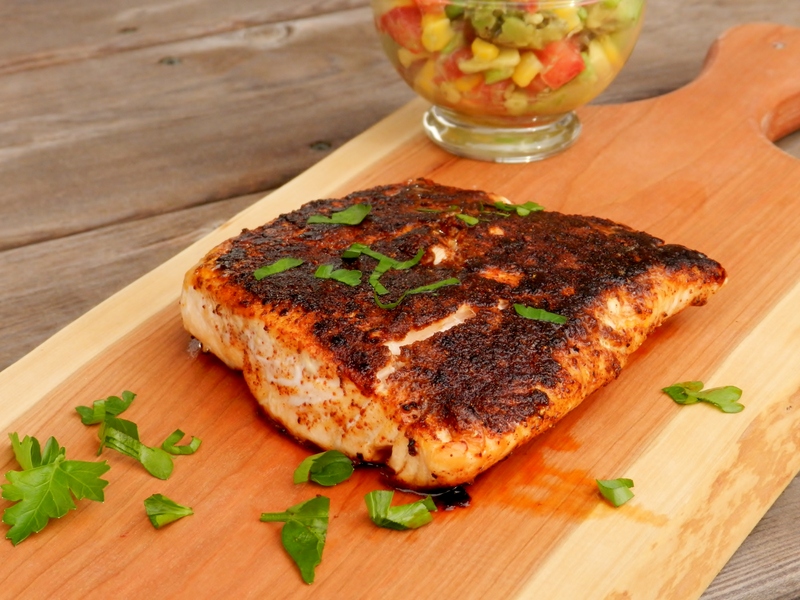 Put the lid on the pan, reduce the heat to medium and cook for another 4-5 minutes, or until the salmon is cooked through. Remove the filets and set aside. Add the minced garlic and diced onion to the pan and saute for 2-3 minutes, until the onions soften and become translucent. Julienne the carrots (aka- cut them into thin match-stick pieces) and add them to the pan. Cook for 2 minutes. Slice the bok choy and mushrooms and add them to the pan. Continue cooking for another 2 minutes. Add all other ingredients and cook for another 2-3 minutes, or until all the vegetables are tender yet still crisp. 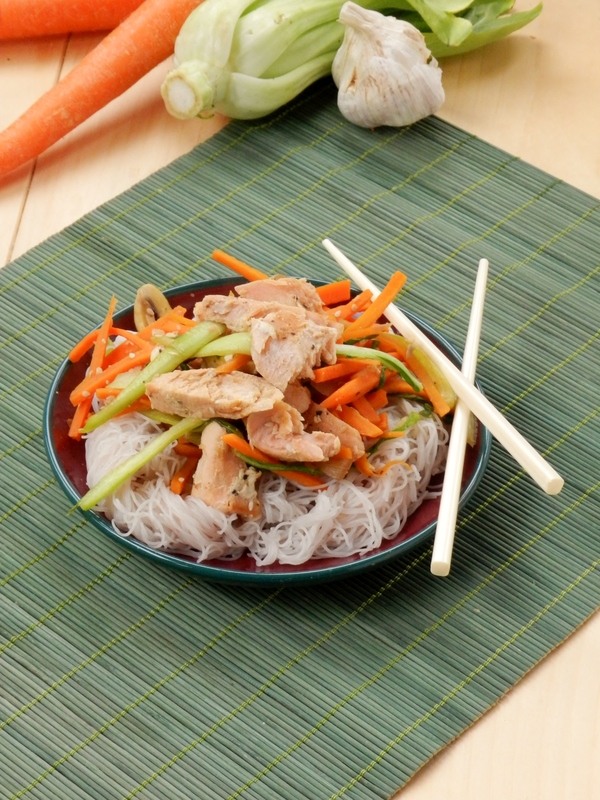 Serves over rice or noodles, is desired. What are your favourite veggies to put in a stir-fry? 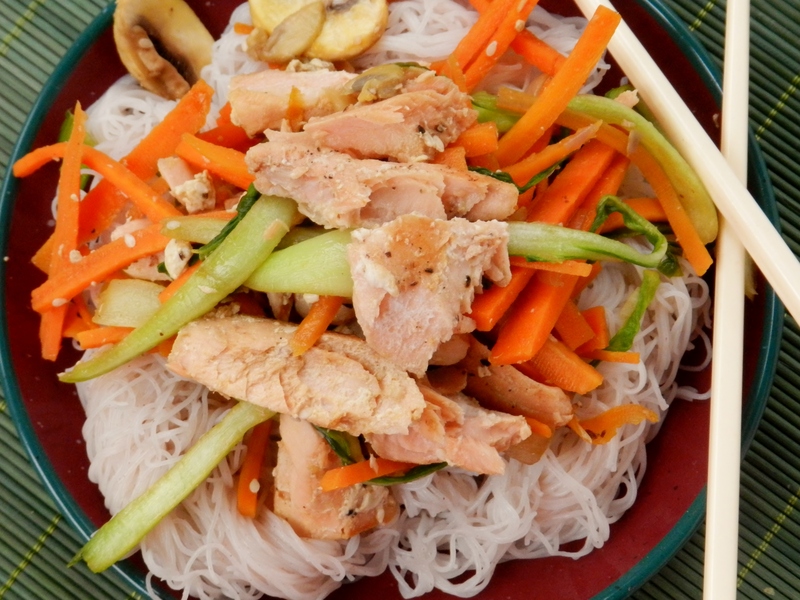 Posted in Uncategorized and tagged 1-pot meal, bok choy, carrots, dinner, easy dinner, fish, food, garlic, ginger, grain, healthy, healthy fats, low fat, low sodium, low-sodium soy sauce, mushrooms, noodles, onions, protein, quick dinner, rice, salmon, salmon stir-fry, simple, soy sauce, stir-fry, Two Saucy Sisters, twosaucysisters, vegetables, veggie stir-fry. Bookmark the permalink. 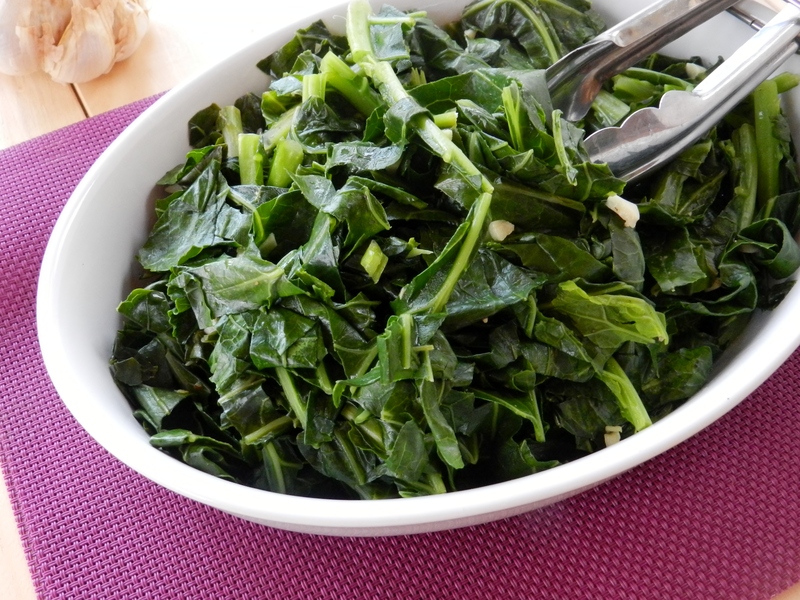 Yesterday we gave you our creamy coleslaw recipe, so today we’re moving on to the other side [of the plate] to talk about collard greens! 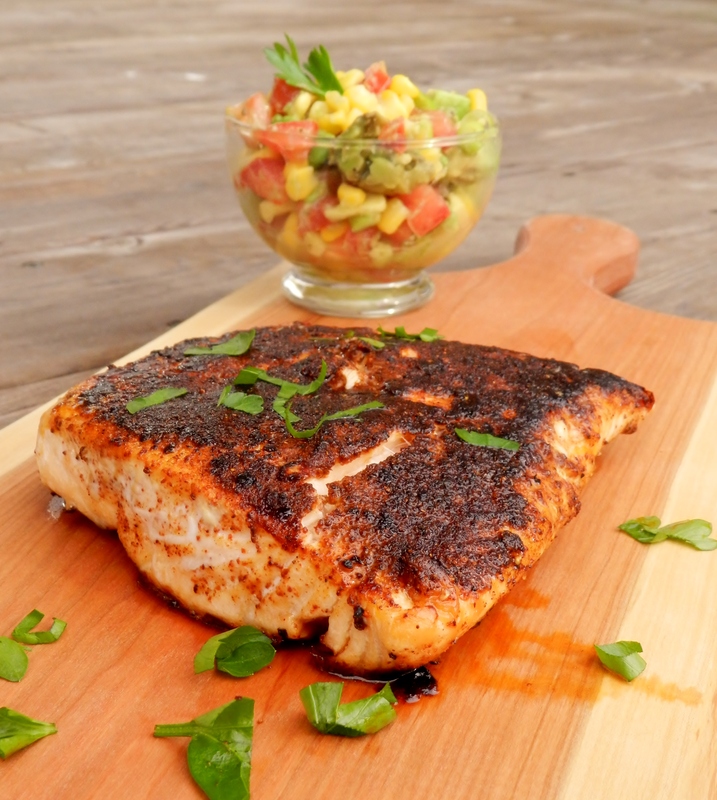 We suppose now is as good a time as any to explain to you the inspiration behind this meal. There’s a restaurant near our house called Memphis Fire Barbecue Company. Our brothers and father discovered it sometime while we were away at school. We came home one weekend and they were all excited about this great new place and couldn’t wait for us to try it! We were a little skeptical because the whole “meat, meat and more meat” thing isn’t really our scene- not that we don’t like meat, just not in such large quantities, you know? But when we got home late from work and really didn’t feel like cooking anything we caved and agreed to order-in some Memphis. So now you’re probably expecting us to say that we were blown away and couldn’t believe that we had ever thought we wouldn’t like it, aren’t you? The truth is, we weren’t. Like we said, large amounts of meat really aren’t our thing. We liked it well enough, but we weren’t head-over-heals for it or anything. Our brothers, of course, were in heaven! The funny thing is, though, is that while the pulled pork was definitely the star of the show, our brothers couldn’t stop raving about the collard greens! We had to agree with them, they were pretty tasty! Of course, they were cooked in a fairly large amount of butter, and there were salty bacon bits in them, so they weren’t exactly the healthiest greens we’ve ever eaten. But we knew that they could easily be healthified (yup-that’s a word) and still taste great! How did we do it? First off, we decreased the butter (confession: we had no butter left over in the house so we used margarine) and used low-sodium vegetable stock to help with the wilting process and give the greens a little more flavour. Also, since we don’t really like bacon all that much (we know, we know, we’re crazy) we left it out and instead used some liquid smoke to achieve that coveted smokey flavour that bacon imparts on the collard greens. Toss in some garlic et voila! 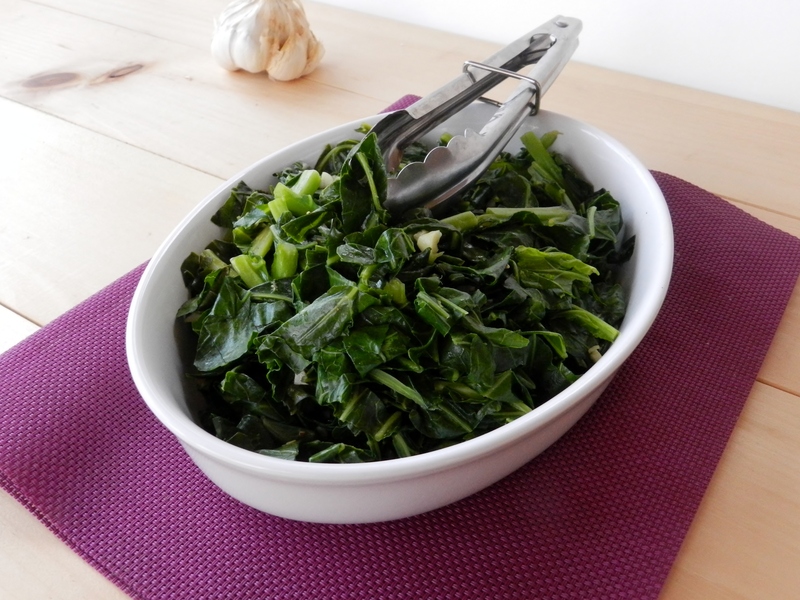 You have healthy, tasty collard greens! Melt butter or margarine in a large pan over medium heat. 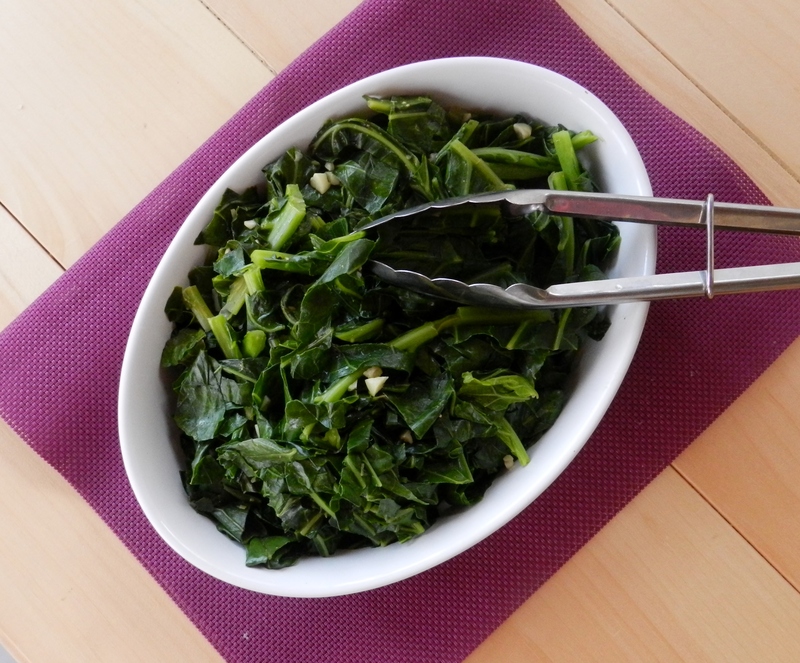 Chop the collard greens into thick strips. 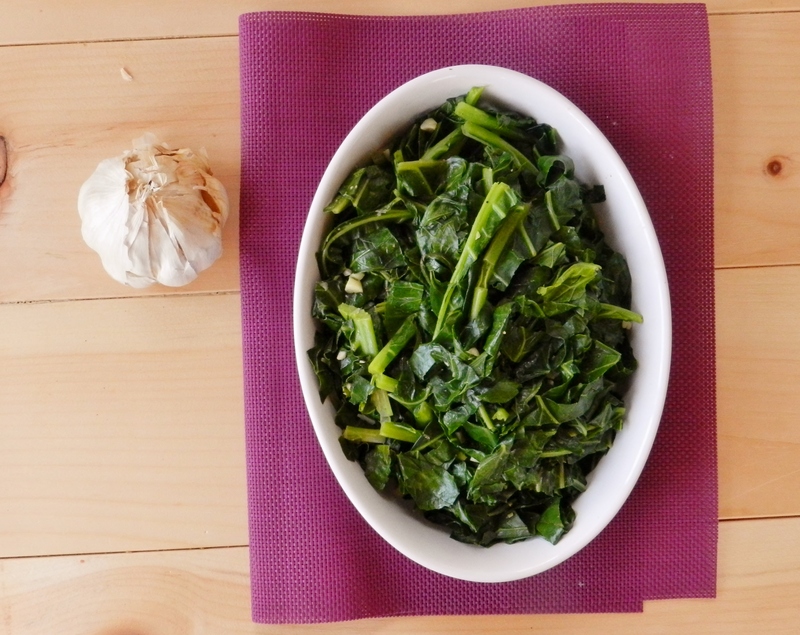 Add the chopped greens and garlic to the pan and cook, stirring often, until slightly wilted (about 5 minutes). Add the stock and liquid smoke and continue to cook until the greens are wilted and most of the liquid has evaporated, about 10-15 minutes. Remove from heat and season with a dash of salt. What restaurants does your family love? 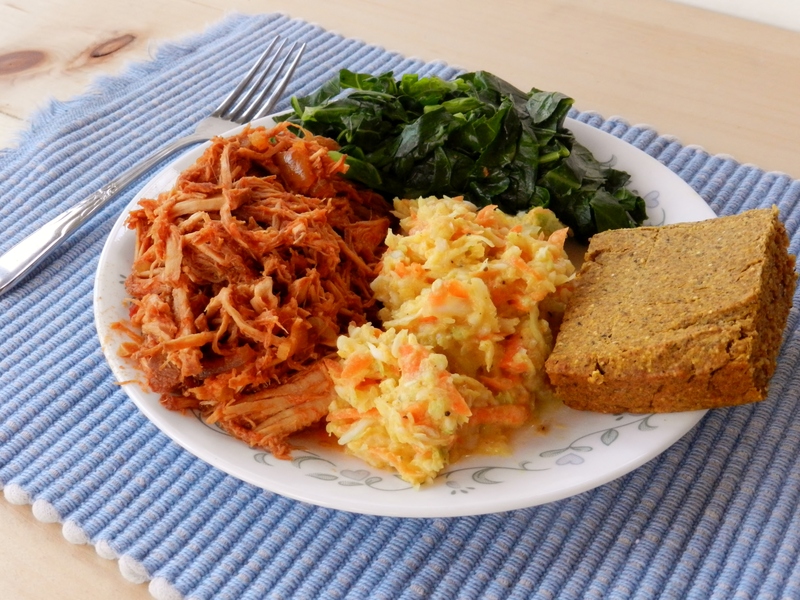 Have you ever had collard greens before? Posted in Uncategorized and tagged bacon, bacon bits, barbecue, barbecue company, butter, collard greens, cook, creamy coleslaw recipe, dinner, food, garlic, greens, head over heals, healthy, healthy collard greens, liquid smoke, low fat, low sodium, margarine, meat, Memphis Barbecue Fire, memphis fire, pan, pulled pork, restaurant, saute, side dish, vegetable stock, vegetarian. Bookmark the permalink. 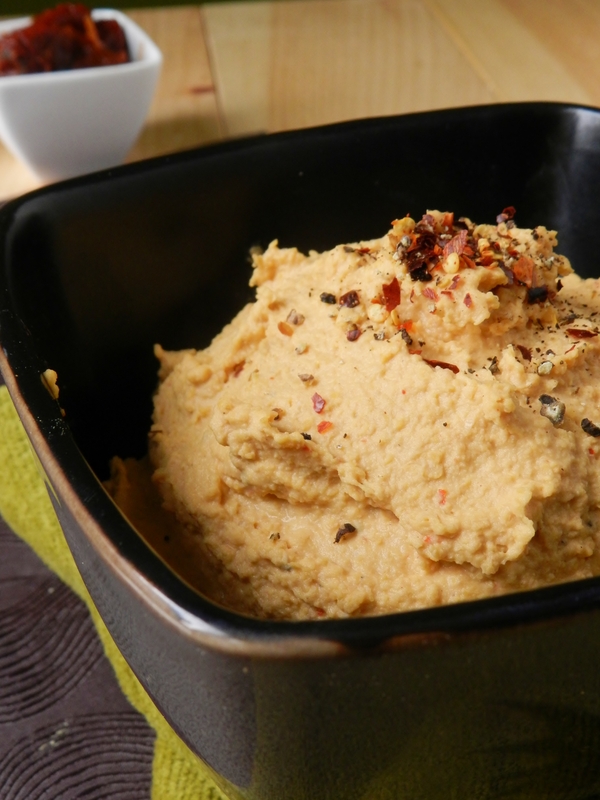 This roasted garlic hummus is much more traditional, but traditional doesn’t mean boring! An entire bulb of roasted garlic went into this batch, so it definitely wasn’t lacking in flavour! 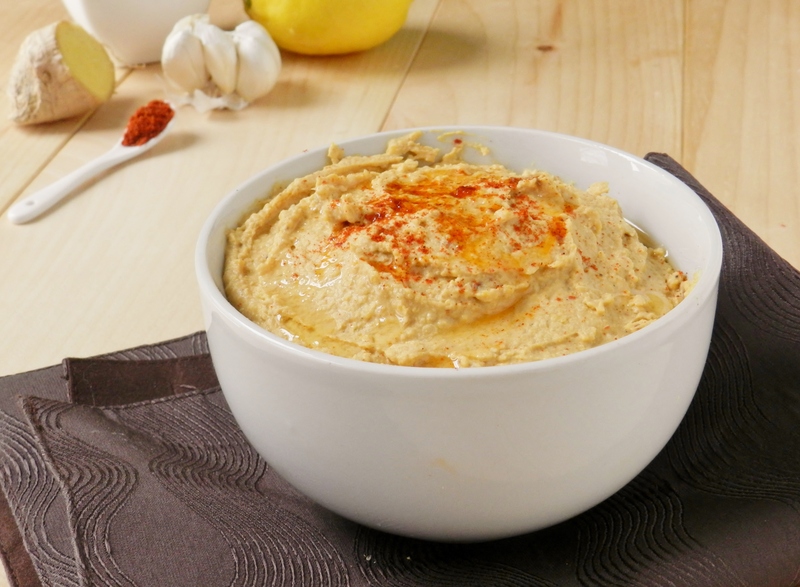 This hummus truly embodies the idea that simplicity is delicious. 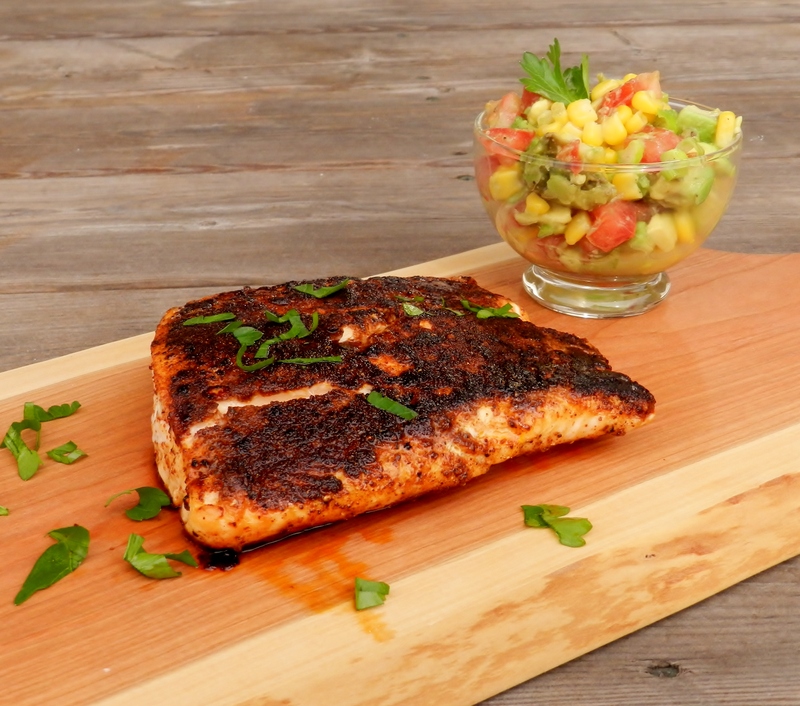 Its easy, quick, and healthy. 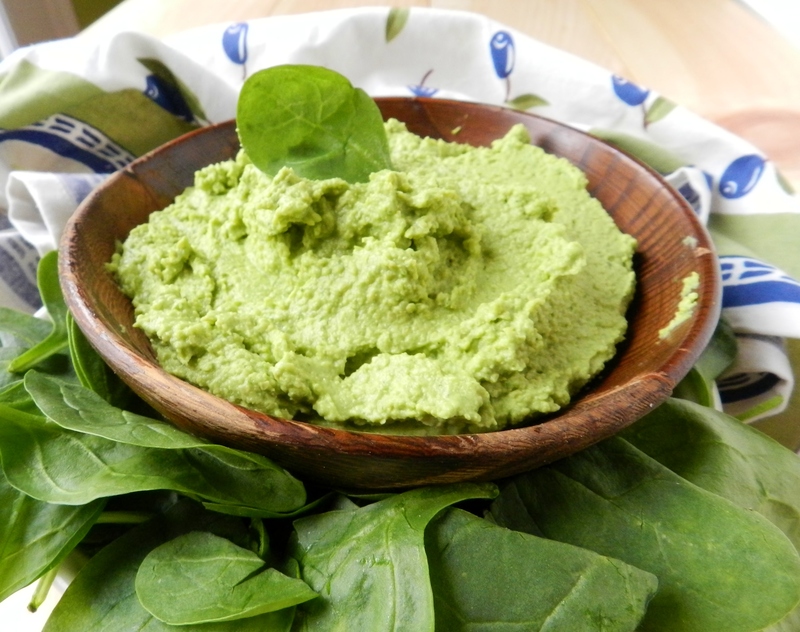 And if green colour of the spinach hummus scares you a bit, maybe this one would be more up your alley? 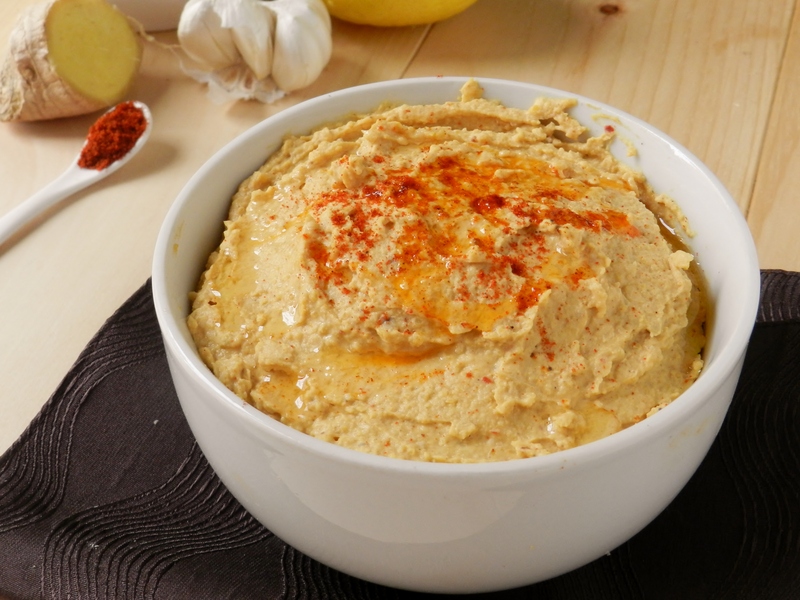 At any rate, you should give this hummus a try, and then get ready, because we’ve still got another rendition coming your way! Preheat your oven to 350C. Slice the top of your garlic bulb (just the tips) off and drizzle with a tiny bit of olive oil. 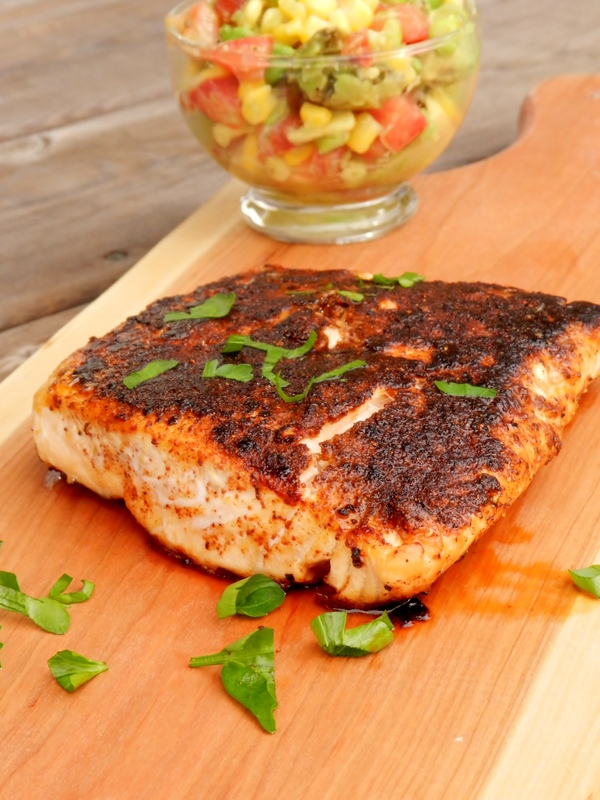 Wrap in aluminum foil and roast in the oven for about 30 minutes, or until soft, lightly browned and aromatic. Once the garlic has cooled off a bit, place all other ingredients in a high-powered blender or food processor and blend until smooth and creamy. Have you ever roasted garlic? What is your favourite way to enjoy it? 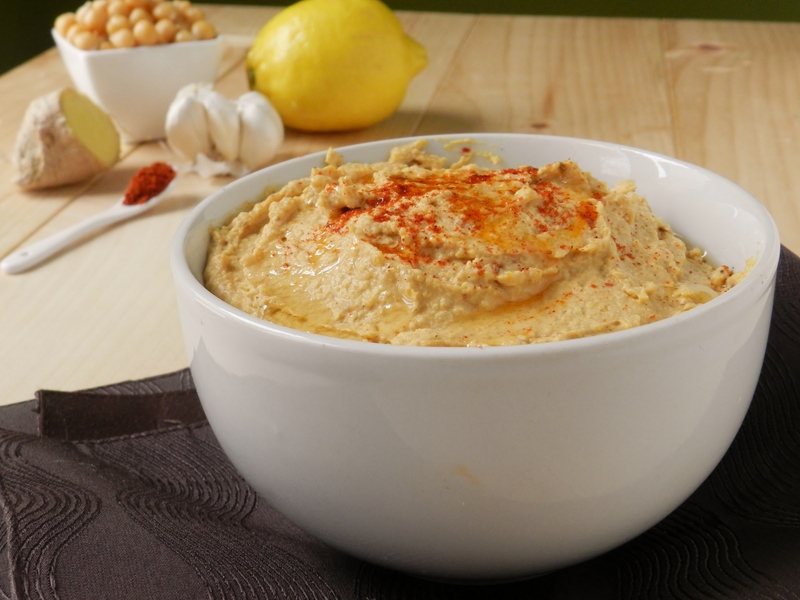 Posted in Uncategorized and tagged appetizer, chickpeas, dip, easy, fibre, food, garlic, garlic bulb, garlic hummus, healthy, hummus, hummus recipes, low fat, protein, quick, roast garlic, roasted garlic, side, tahini, vegetarian. Bookmark the permalink. Happy What I Ate Wednesday everybody! 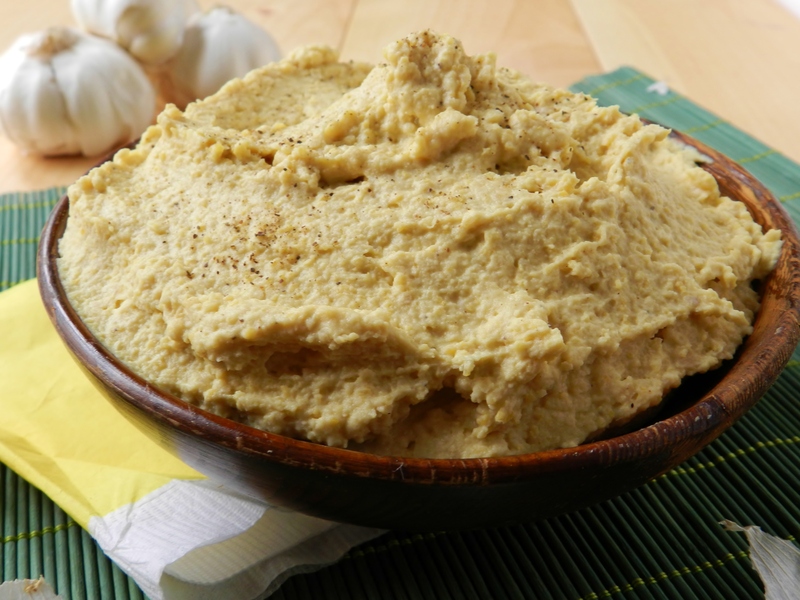 A couple weeks ago we professed our love for hummus and gave you a recipe for artichoke and garlic hummus. 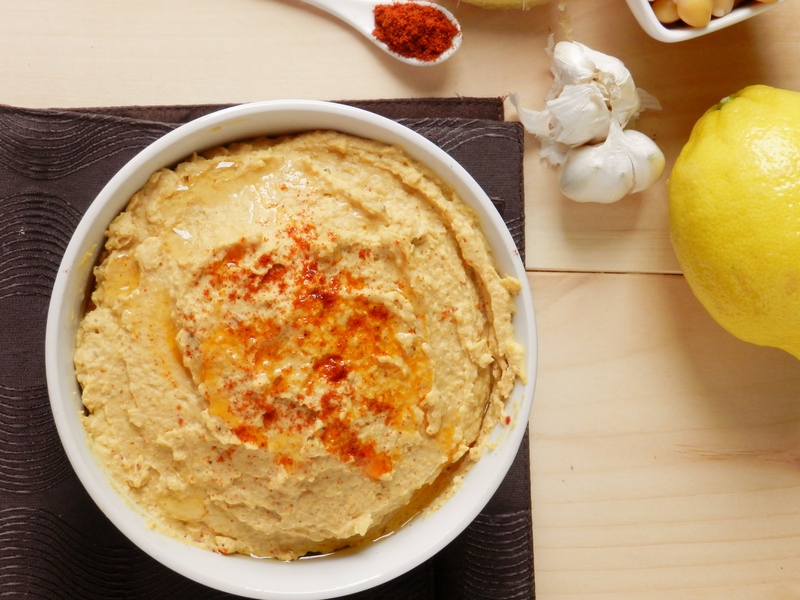 Well, ever since then we’ve been on a major hummus-kick! We just can’t seem to get enough. You know how there are those cravings you get where you just have to have a certain food, then you eat that food and your craving is satisfied? Well, our craving for hummus is not like that. It is never fully quenched. We may eat it and be temporarily satisfied, but this state is short-lived. Guaranteed at our next meal we will open up the fridge and see the container of hummus sitting there, and that craving will come right back. 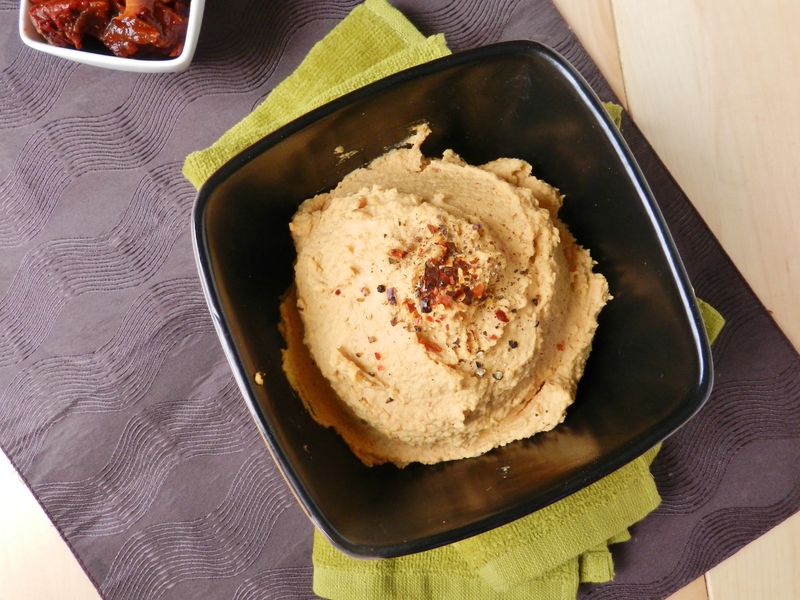 So this week, we are declaring What I Ate Wednesday to be the hummus edition because we are bring you not one, not two, but three new hummus recipes! And you know what? We had two more flavours that we wanted to make, but we ran out of tahini! Tragic, we know. This recipe was inspired by a trip to the Covent Garden Market here in London, where we tried this flavour from a restaurant there called Nate’s. 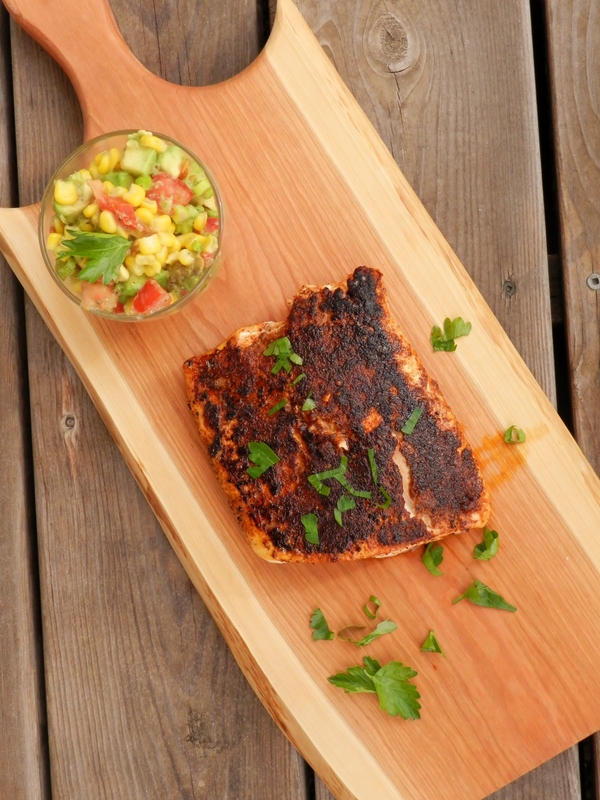 It was so delicious we knew instantly that we had to recreate it at home. This stuff was gone in less than two days. 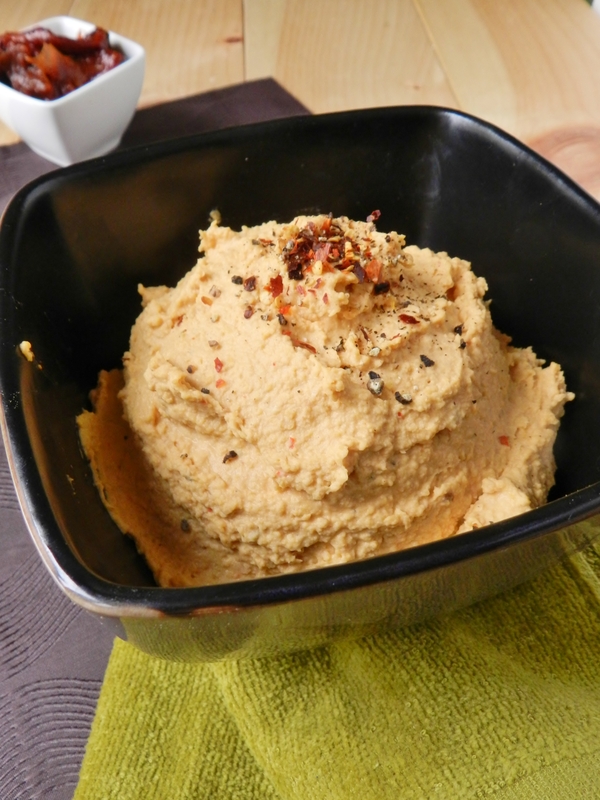 An entire bulb of roasted garlic went into this lovely golden hummus! Not the kind of stuff you want to order on your first date, but delicious none-the-less! 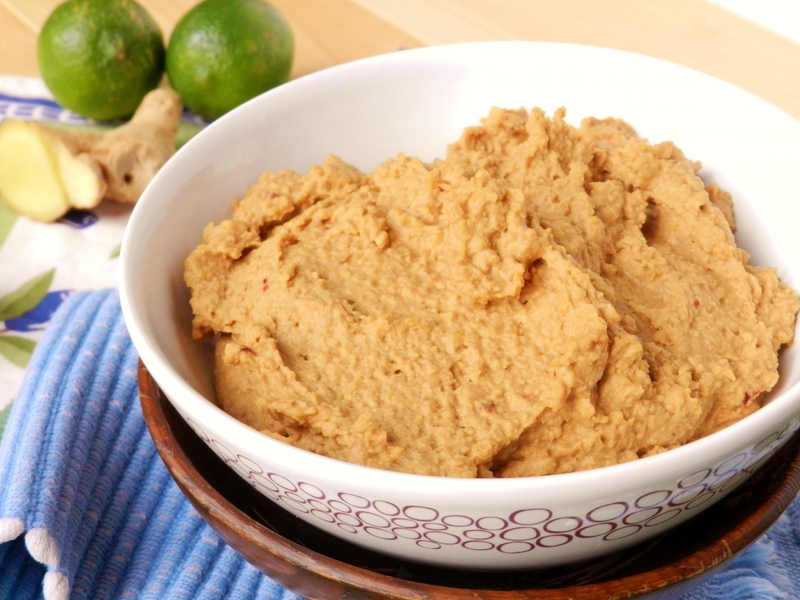 And finally, a much more non-traditional flavour: Thai Peanut Ginger Lime Hummus! This was our favourite out of all three! We really can’t say enough about it, except that it was absolutely packed with flavour! It’s Asian meets Middle Eastern meets Mediterranean fusion- all of the best rolled into one! For now, though, we suggest you do two things: First, head on over to visit Jenn at Peas and Crayons to see what all the other WIAW participants have been eating, and second- GO BUY A WHOLE LOT OF CHICKPEAS. Posted in Uncategorized and tagged covent garden market, dip, food, garlic, garlic hummus, healthy, high protein, hummus, hummus recipes, restaurants, roasted garlic, side, spinach, thai, vegetarian, WIAW. Bookmark the permalink.